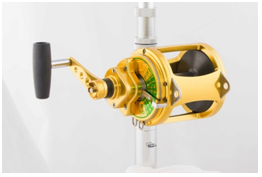 For more than 3 decades the Everol Special Series 18/0 fishing reel held the world record as the largest production reel on the planet. Not anymore! In March 2014, Everol will release the Special Series 20/0 which has an unmatched line capacity of 5,300 yards of 100 pound test monofilament or 14,000 yards of 130 pound braided line. This beast can apply over 180 pounds of drag on a fish. This Everol is perfect for big money tournaments. When targeting black marlin or blue fin tuna, getting ‘spooled’ could cost someone upwards of $1,000,000 in lost prize money and Calcutta side bets. The goliath Special Series 20/0 is the latest rage with the land-based shark fishing community which is rapidly growing in U.S. popularity. 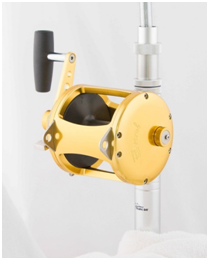 The stock 20/0 reel comes standard with gold anodizing. 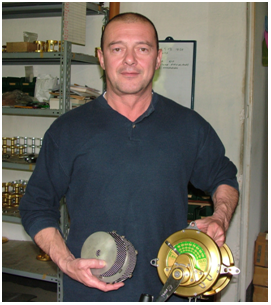 On a whim, the factory in Italy produced a few of these historic fishing reels in Black, Blue, Silver, Red, Green, and Violet. In less than one week, Everol sold out of every reel in every color. There is currently a 4 to 6 week backlog on the 20/0 reel. and Owner of the Everol factory in Italy, holding the Special Series 20/0. 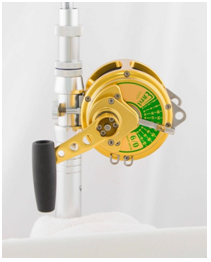 Everol has handcrafted the best offshore fishing reels in the world since 1958. Each reel is handmade one at a time. Largest Fishing Reel in the World Gets Even BIGGER! The Everol T-shot range have been designed specifically with braid in mind, they are light but very strong. The reels have a powerful and smoothly progressive multi disc drag system and a fast retrieve gear ratio for fast moving fish. The reels have a smooth and precision operation courtesy of the six ball bearing design. The ergonomic design of the handle with offset T bar ensures comfort and a firm grip in a prolonged fight with large fish. The original Canyon Special (4/0) became a top seller when it was launched two years ago because it harnessed the power of a big 80 lb. Aeel in the body of a small 30 pound class real. The Canyon Special 6/0 will push the concept even further by putting huge drag in a small package, but upping the ante on line capacity. The jigging concept is more than 100 years old but has enjoyed a rebirth in fishing success over the past decade. The Everol jigger series offers enormous power and silky smooth operation for those fisherman that demand the best when jigging huge fish with small reels. 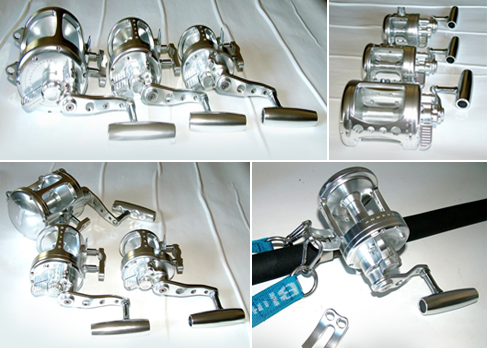 Grouper, Tuna, Snapper, Cobia and Amberjack will be hitting your icebox when using this outstanding reel.